Traverse three most sought after countries in Europe: Spain, France and Italy in 12 days! Explore iconic sights of sunny Barcelona and its old town, continue to the French Provence region to discover Avignon. Then on to the French Riviera to take in the beauty of Nice and Cannes. As a grand tour finale spend amazing time in Italian Milan, recognized worldwide as a fashion capital. Welcome to the lively capital of Spain's Catalonia - Barcelona! Your driver meets you at the exit gates of the airport holding a sign with your name on it and transfers you to your centrally located hotel. After breakfast at your hotel, you meet your guide in the hotel lobby and go on a wonderful half-day walking tour around the most outstanding attractions of Barcelona. You then proceed to the Ribera shore district where you see the Santa Maria del Mar church - the former residence of sailors, traders, and craftsmen who lived and worked there in the Middle Ages. The tour finishes on the most vivid street in Barcelona La Rambla, where you can take a rest at one of the open-air terraces. Today you have the day free to continue enjoying Barcelona on your own or join our carefully planned optional Gaudi Tour. Enjoy a fantastic half-day tour dedicated to the world-renowned architectural works of Antonio Gaudi. During the tour you get to see his astonishing creations and find out some facts about his one-of-a-kind construction techniques and his life story. You see Sagrada Familia Cathedral, Park Guell, Batlló House and Milà House. In the afternoon you have a transfer to the railway station for a train ride to Avignon (1st class tickets are included). Upon arrival, in 4 hours you are transferred to your downtown hotel for a check-in. The rest of the day is free. Following breakfast, at your hotel, you meet your guide in the hotel lobby and go on a 3-hour walking tour of Avignon, which was the seat of the papacy in the 14th century. Together you go to the famous Pont de Avignon Saint Benezet bridge dating back to the 12th century and the museum. Then continue to the Place de l'Horloge or “clock square” and see its elegant Town Hall and stage theater. You pass nice cobblestone shopping streets and have an inside visit to the Popes’ Palace where the popes lived in the 14th century, taking advantage of your skip-the-line entrance. The Popes Palace is the largest Gothic building in the world and you get to learn about the everyday life of the nine popes who lived there in splendor and luxury. After the tour, you return to the hotel and have the rest of the day free. Today you have the day free to continue enjoying Avignon on your own or join our carefully planned optional Provence Tour. In the morning after breakfast, you check out from the hotel and have a transfer to the train station where you board a train to the outstanding French city Cannes. Upon arrival in about five hours, your driver takes you to your centrally located hotel for check-in. The rest of the day is at leisure. After breakfast, meet your guide and start a 3-hour walking tour of Cannes. During the tour, you see the old town called le Suquet, and the waterfront Boulevard de la Croisette, where the Cannes Film Festival is held every year, and the Palais des Festivals et des Congres from outside. After the tour, you return to the hotel and rest of the day is at leisure. Take the opportunity at your free time to take a boat to Saint Marguerite Island, famously known for the Man in the Iron Mask! Enjoy walk up to the Fort, visit a museum, and enjoy wonderful views of Cannes. Following breakfast, take a train to Nice and within just 30 minutes meet your local guide at the station. Start your 3-hour walking tour around the most stunning Nice attractions from the oldest times with the Greek and Roman ruins, to the more recent era of Belle Epoque with the palaces of the last century. During the tour, you stroll through the cobblestone narrow streets of the picturesque Old Town abundant in souvenir stalls, cafes and shops, see the Castle Hill, with the ruins of the former Chateau de Nice and walk along the Promenade des Anglais that stretches through the entire city coastline with the Baie des Anges and the beaches on one side, and beautiful buildings, including the breathtaking hotel Negresco, on the other. After the city tour, you have some free time to enjoy Nice on your own before getting back to Cannes by train. Today you have the day free to continue enjoying Cannes on your own or join our carefully planned optional Day Trip to Monaco, Monte Carlo and Eze. Together with your private driver-guide and go on a half-day tour to the tiny royal principality Monaco, see its top sights. As a tour highlight, enter Monte-Carlo Casino. After you take a trip to the picture-postcard Eze village which is often called "eagle nest". After breakfast, you check out from the hotel and are transferred to the train station in Nice where you board a train to Milan (1st class train tickets included). Upon arrival in approximately 5 hours, your driver takes you to your centrally located hotel for check-in. The rest of the day is free for you to enjoy Milan, and possibly explore the world famous shopping and fashion avenue, Quadrilatero della Moda. Following breakfast, you meet your guide in the hotel lobby and have a 3-hour walking tour of Milan to learn more about the city’s history and reputation as a fashion capital. You start by visiting world-known Milan Duomo, the Gothic cathedral and the highest sight in the city which took about six centuries to build. Then you walk through nearby-located Galleria Vittorio Emanuele and reach La Scala Theatre. Prepare to be wowed by the prestigious Milan opera house (no entrance is included). 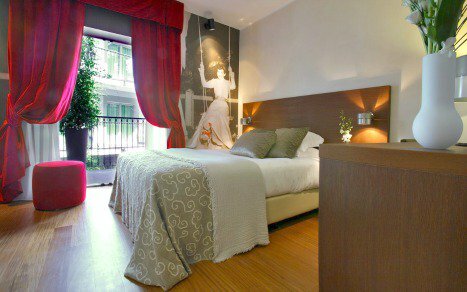 You continue with picturesque Brera district to feel the historical atmosphere of the city. Explore the public areas, with stories of its 15th-century owners ringing in your ears. After all you make a stop at Castello Sforzesco to see history and style combined with Milanese flair. Please note: Milan Cathedral is a sacred religious site thus the dress code for visiting it is applied just as when you visit any church in Italy: no shorts – no uncovered knees and shoulders, no backpacks. This is the last day of your amazing tour to Spain, France, and Italy! After breakfast, your driver meets you at the hotel lobby and takes you to the airport for your flight back home. In France, you can expect to find some shops, restaurants, and museums closed for lunch between 12 p.m. and 2 p.m., in Italy from 1 p.m. to 4 p.m. In Spain, small shops close for lunch from around 2 p.m. to 5 p.m., some bars close from 4 p.m. until around 8 p.m. or even 9 p.m. In France, most communication equipment takes 220/110 volts, you will need an adapter plug (type E) to make your plug fit into the socket. In Spain and Italy, the power sockets are of type F, the standard voltage is 230 volts. It was an astonishing vacation!